My mom was a gift giver. Gifts were her love language - gifts and cards. She loved wrapping them as well. She planned all year long for Christmas. She often bought things at end of the year sales and held them for the following year. We all got Christmas gifts from Mom on Christmas day. Even though she was fighting with cancer, she was determined to get the gifts mailed to Alaska. She didn't make it, but I was able to bring the gifts back with me - we love Alaska Air Club 49!!!! None of us had the money, the time, or the heart to do a lot of shopping....but we had Mom's gifts. I'll post more about that later...it's still a surreal time for me. 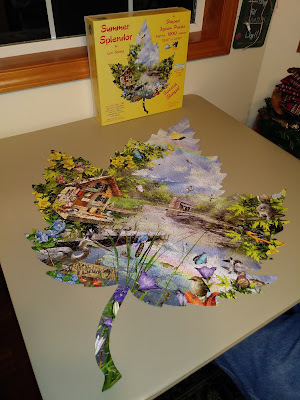 This is an AMAZING puzzle. It's in the shape of a leaf....there are NO straight edges....not one. In case that wouldn't be hard enough many of the pieces were odd shapes...a cat, a moon, a sun, a wheelbarrow...you get the idea. Izaak brought a card table in and he, Jamin, Nolan and Michael set to work it. 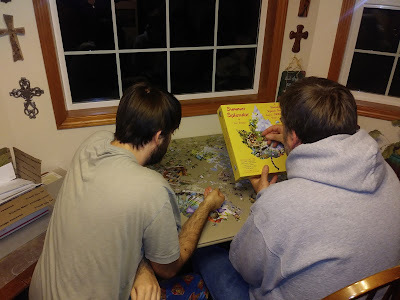 After the first night, Nolan and Michael did most the work on the puzzle.